The Completion Ceremony of the Japan-Kazakhstan Joint Project for Nuclear Security at the Institute of Nuclear Physics of the Republic of Kazakhstan was held at the Institute in Almaty on 28 May, 2013 with the attendance of the representatives of the Japan-Kazakhstan Committee on Cooperation for the Destruction of Nuclear Weapons Reduced in the Republic of Kazakhstan : Ambassador of Japan to the Republic of Kazakhstan H.E. Mr. Yuzo Harada and Chairman of the Atomic Energy Committee of the Ministry of Industry and New Technologies of the Republic of Kazakhstan Dr. Timur Zhantikin and other distinguished guests from both Japan and Kazakhstan. The Project worth 89 million JPY (approx. 1.1 million USD) was implemented for strengthening of nuclear security of the Institute, based on the Implementing Arrangement agreed between the Japan-Kazakhstan Committee and the Ministry of Industry and New Technologies of the Republic of Kazakhstan in November 2011. The Project was also referred to in the National Progress Reports of both countries at the Seoul Nuclear Security Summit held in March, 2012, and it is expected to contribute toward further strengthening of nuclear security in Kazakhstan, together with the similar project for the Ulba Metallurgical Plant. 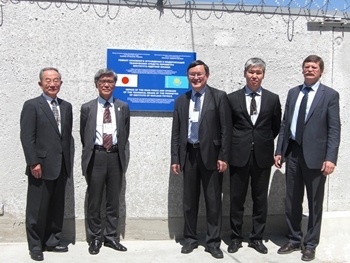 At the Ceremony, the Japanese assistance was repeatedly appreciated by the representatives of Kazakhstan. The Japanese representatives also expressed their strong expectation that this Project will make a great contribution not only to enhance nuclear security in Kazakhstan, but also to strengthen closer bilateral relationship between Japan and Kazakhstan.